Normally, to produce honey, bees collect nectar from nearby flowers and return to the hive to store it in honeycombs. But if other tasty “sweets” are within reach, bees may change their diet, especially in dry weather. And the result may be disastrous. This is what happened recently in northeastern France. Beekeepers in Ribeauvillé found themselves in a sticky situation after bees from their hives began producing honey in shades of blue and green. An investigation uncovered the cause of the problem: Instead of collecting nectar from flowers, local bees were feeding on remnants of colored M&M candy shells, which were being processed by a biogas plant roughly 2.5 miles (4 kilometers) away. 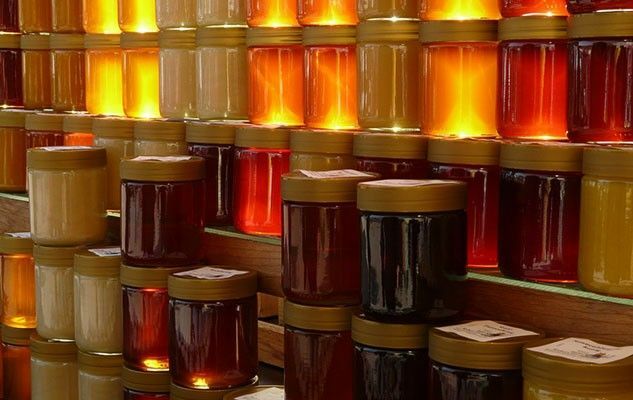 The colored honey could not be sold because it did not meet most countries’s standards of honey production: It was not obtained from the nectar of plants and it deviated from the standard coloring of honey (nearly colorless to dark brown).